Content warning: Article discusses topics of youth suicide and mental illness. For a significant part of her childhood, Ashley Cummings struggled with allergies. When she went to school, she would frequently develop hives, and would regularly take an over-the-counter, and sometimes, when the reactions were particularly bad, she’d leave school early. At one point in time, the reactions occurred so frequently that she stayed at home and was homeschooled. It was clear that something was wrong, so her family scheduled allergy tests with a doctor. But in order for this to happen, she had to travel over 2,000 kilometres by plane. Cummings is from Pangnirtung, Nunavut, a small town of roughly 1,500 people located on the southern tip of Baffin Island and at the base of Mount Duval. The town looks onto an ancient riverbed that has been eroding over thousands of years, forming the iconic Akshayuk Pass, formerly known as the Pangnirtung Pass. Surrounded by mountains, the unmistakable tundra appears barren to those who are unfamiliar, but is rich with berries, willows, and heather to locals. Today about 30 businesses dot the town, including several outfitting stores, a courier service, seven contractors and an arts and craft gallery. An airport strip parallels the pass, an essential service for many whose remoteness requires trips to towns like Iqaluit, Happy Valley-Goose Bay and sometimes more distant places like Ottawa. Cummings did fly to Ottawa, more than once. Although she never found out what she was allergic to, the trips weren’t unusual occasions for her. Health-care services are essential to everybody, but residents of northern communities are in particularly urgent need of them compared to their southern counterparts. As of 2008, children and teens in the Nunangat have a five times greater risk of death than their cohort in the rest of Canada. They’re 11 times more likely to succumb to an injury or an infectious/parasitic illnesses, and twice as likely to succumb to a non-communicable disease. But out of all the reasons for Inuit mortality, suicide is the leading cause, occuring at one of the highest rates in the world. Among children and teens in the Inuit Nunangat, suicide is 30 times more likely to occur than among youth who live in the south of Canada, as reported by Statistics Canada for the period between 2004 to 2008. Part of the problem is the lack of access to services, with mental health resources among the scarcest in the Nunangat. When Cummings was in elementary and middle school, she recalls that there were no mental health programs or education. “The problem that arises in the northern communities is that there’s no opportunity to learn more about [mental health]. That lack of mental health education is what ends up perpetuating and making the [mental health] stigma more obvious than in a southern community like Sackville,” Cummings said. In addition, years of colonization, high costs of food and other goods, and intergenerational trauma brought by the residential school system have compounded the effects of the area’s lack of health-care resources, resulting in high rates of untreated mental illness. She was eventually diagnosed with depression about seven months after moving to the Maritime province. This was when Cummings started “talking about all the suicides [she’s] faced, about her own thoughts about it” and learned that depression is curable and suicide is preventable. Since then, Cummings has been motivated to reduce the number of suicides in her community and others across the north. In high school, she participated in Students on Ice (SOI), an organization that educates youth about the Polar Regions through immersive expeditions. This was when she met her future team members, Eva Wu, Gabrielle Foss and Patrick Hickey, whom she would later work with to promote mental health in the north. At the time, Wu, now a student at McGill, and Foss, now a student at Western, had been working with Art with Heart, a project that involved creating original photo books for hospitals and retirement homes in Toronto, which they co-founded in 2014. After learning about the prevalence of untreated mental illness through their expeditions with SOI, the pair expanded their project to include mental health and renamed it North in Focus (NIF). Hickey joined the pair in 2015 as the education and mental health program coordinator, and in 2016, Cummings became the northern consultant, alumni and ambassador coordinator. NIF specializes in leading after-school programming for youth over the ages of 12, combining art, physical recreation and meditation with mental health promotion and anti-stigma education. 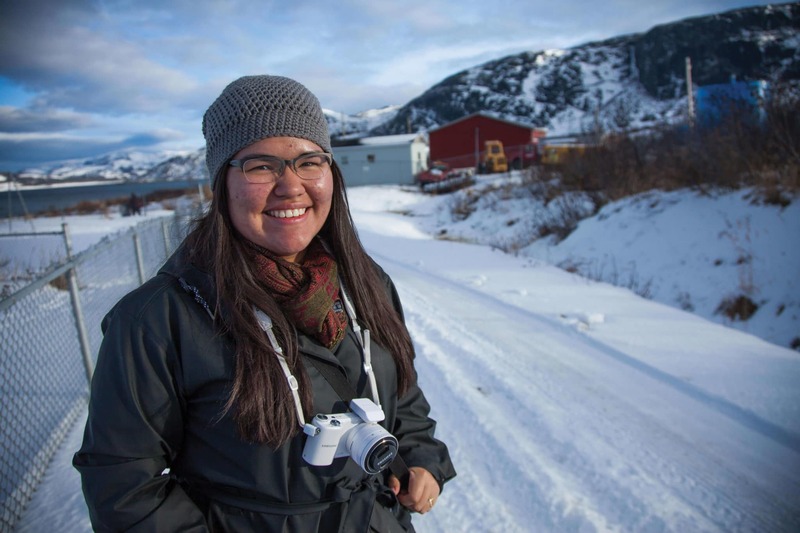 Cummings’ involvement with NIF brought her to Nain, Nunatsiavut, for her first workshop experience with youth in 2016. The week started with a game called “hand up, hand down” that Cummings said was to “show kids they have mental health.” Children answer a variety of questions like “Do you like sushi? Hand up, hand down,” “Do you like dancing? Hand up, hand down.” The hands are meant to be raised, because once the final question is asked – “Do you have mental health?” – everybody’s hands should be in the air. Most recently, Cummings’ involvement with NIF brought her to Reykjavik, Iceland, in Oct. 2017 for the fifth annual Arctic Circle Assembly, where she and her teammates presented a proposal on their work promoting mental health and suicide awareness to youth. The assembly connects “leaders around the Arctic Circle, as well as different allies, who connect on the basis of the Arctic, caring for the Arctic, and ensuring it has a future,” Cummings said. Over 2,000 participants representing over 60 countries attended that year. In its short history, the assembly has not had a major health component, instead focusing primarily on “infrastructure, climate change and supporting people in the Arctic,” according to Cummings. As mental healthcare advocates, Cummings and her team at North in Focus had decided to apply. Among the speakers at the assembly was filmmaker Alethea Arnaquq-Baril, whose film Angry Inuk was screened at the Ralph Pickard library on Jan. 18. Due for a second screening in Sackville, the film documents the history of anti seal-hunting propaganda and its effects on Inuit communities. Also among the assembly’s other attendees were Canadian politicians Carolyn Bennett, Minister of Crown-Indigenous Relations and Northern Affairs, and Stéphane Dion, the ambassador to Germany and Special Envoy to the European Union and Europe. “It almost felt alien, seeing these very important people take us very seriously, because although we’ve been lucky and we’ve been endlessly supported throughout, we’ve always expected when we’re around certain people, or if they’re important, they might not have the time for us, and we’ve accepted that,” Cummings said. Duncan Phillips, vice-president of Mitacs, a national non-profit research support centre, was impressed with the group’s presentation at the assembly and nominated it for the Arctic Inspiration Prize. As finalists, North in Focus is waiting to learn the prize results, which come out at the end of January. A national Loran Scholarship finalist, Cummings is in her second year at Mount Allison pursuing a B.A. in psychology and English. She is currently preparing for NIF’s upcoming summer workshops in Nunavut, and wants students to feel comfortable approaching her about the topics she’s passionate about.